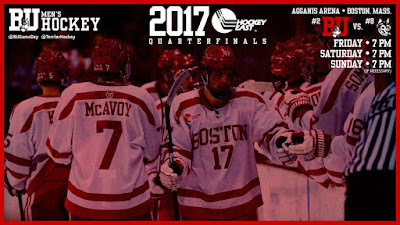 After earning a share of the regular-season conference crown on the final day of the regular season, the #8/6 Terriers begin their pursuit of the conference tournament title, hosting Northeastern in the best-of-three quarterfinals. Puck drop tonight is 7 p.m. for the contest that will be streamed on HockeyEastTV (PPV). #8 seed Northeastern is the defending Hockey East tournament champion, while #2 seed BU won the 2015 tournament. The series presents a match-up of opposing strengths. BU led all HE teams in goals against (2.14) in conference games and boasts a strong penalty-killing unit. Northeastern had the third best offense in conference play (3.32) and the top power play at a gaudy 30.1%. The Huskies have been a strong first-period team, while BU's best scoring period is the third. The Huskies are led by Hobey Baker candidate Zach Aston-Reese with 62 points, Dylan Sikura with 56 points and Adam Gaudette with 52. Freshmen Clayton Keller and Patrick Harper lead BU with 38 and 34 points respectively, followed by Bobo Carpenter (30), Jakob Forsbacka Karlsson (28) and Jordan Greenway (27). Former BU and NHL defenseman Ryan Whitney has made a smooth transition from player to NHL.com on-air analyst.